I am reading through the book of Judges and once again ran across the account of Jephthah (ch. 10, 11), which has often been misunderstood. I am reposting an updated version of something I wrote several years ago to help clarify this fascinating story. Jephthah lived in the area of Israel called Gilead. Though he grew up in a large and important family, Jephthah was never accepted. This wasn’t something he imagined; his rejection was very real. You see, he was born as the result of his father’s sin. 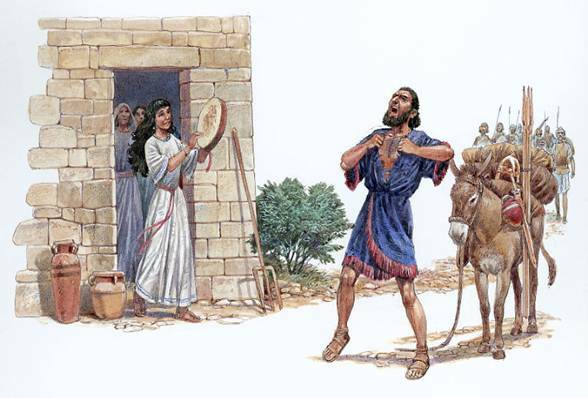 His mother was a prostitute and Jephthah was such an embarrassment to his family that they disowned him. In fact, he was considered such a misfit that the entire town rejected him. He ran away to a barren land and started hanging around with other rejects. They actually became a gang and made Jephthah their leader, and they probably made their living by robbing traders and fighting as mercenaries. In those days Israel was made up of a loose confederation of tribes with no central government or army. When attacked or abused by a more powerful nation-state, God would raise up a leader (Judge) who would be the means of rescue and protection. Gilead’s nemesis was the Ammonite nation just across its boarder to the east, which had just declared war on Israel. The Elders of Gilead were desperate and so they sent a request that Jephthah and his little army come and help them. “Why do you come running to me after you didn’t lift a finger to help when I got kicked out of my family?” Jephthah said. “OK, we screwed up. We are sorry that we didn’t do the right thing. Hey, we’re eating humble pie here by asking you to come and help us,” the Elders replied. Jephthah agreed on condition that they take him back into the community and allow him to lead the entire army against the Ammonites. They agreed. This was Jephthah’s chance to start over and he grabbed it. He moved his family back to his home town and was thankful to God for the opportunity to regain his honor and establish a heritage for himself when his beloved daughter (his only child) was old enough to marry and bear him sons. Jephthah had no other recourse except the sword. He gathered his troops and prepared to march toward the enemy. Before he left, he made a vow to the Lord that “if you give the Ammonites into my hands, whatever comes out of the door of my house to meet me when I return in triumph will be the Lord’s or/and I will sacrifice it as a burnt offering” (Judges 11:31). This was not a bargain, but a vow of gratitude and devotion. Leviticus 27 describes this kind of vow in detail. There was a redemption factor built into most vows so that one could buy back a vowed item by paying a certain value set by the priest. However, if someone dedicated another person in the family (1 Sam. 1:11), animal or family property, these could not be redeemed because they became holy (set apart) to the Lord. So, when Jephthah returned and saw that it was his beloved daughter who first came out of his house to meet him, he was horrified. Was it because he had to kill her as a burnt offering to the Lord? Here we need to interpret Scripture by Scripture; human sacrifice was an abomination to the Lord and was forbidden because Israel was not to be like the surrounding nations (Lev. 18:21; 20:2-5; Deut. 12:31; 18:10). Instead, Jephthah was horrified because he had to sacrifice his only hope for a lineage that would come through the marriage of his daughter. Instead she would now live perpetually as a virgin, as one of the women who ministered to the Lord at the Tabernacle (Ex. 38:8; 1 Sam. 2:22). This is why she mourned her virginity; not because she was going to die, but because she would never have children. The rashness of Jephthah’s vow was not because it condemned his daughter to death, but because it sacrificed her future. It also dashed his hopes; of a family he never had and a dignity that he had never experienced. “Do not be rash with your mouth, nor let your heart be hasty to utter a word before the Lord…It is better that you should not vow than that you should vow and not pay” (Eccles. 5:2-5).